Barnes and Noble are getting into Tablet Game. Exactly 60 days before Christmas 2009 The Nook was introduced to us. The world's most advanced eBook Reader, nook™ by Barnes & Noble. Access over one million books, newspapers, and magazines and download them wirelessly in seconds! nook™ can be pre-ordered today for $259 and will ship in late November. Nook will have free ebooks and book previews available. The pre order for the Nook has begun so if you want to get one as a Christmas or Holiday Gift its recommended that you order early. This will be a big item for 2009 Holidays. Click on nook™ for complete details. Sample eBooks for free just about anywhere you are, on us. Browse eBooks, magazines and newspapers on AT&T's 3G Wireless Network or on Wi-Fi. And every Barnes & Noble has free Wi-Fi, so you can connect at lightning fast speeds. 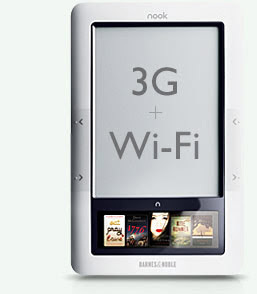 With 2GB of memory, nook stores up to 1,500 books, newspapers and magazines. Need even more space? Just add a memory card for storage of up to 17,500. An entire library light enough to take with you everywhere, so you'll never be without your favorites. Free wireless from Barnes & Noble via AT&T, the nation's fastest 3G network. * and Free Wi-Fi in all Barnes & Noble stores.